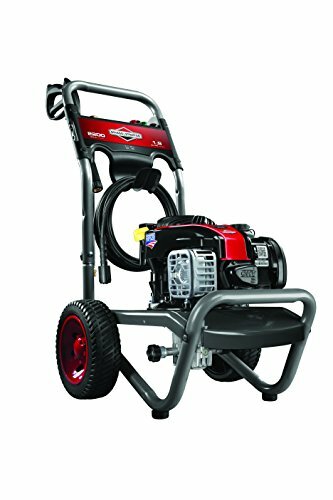 If you are looking for a reliable compromise between a lightweight electric pressure washer and a stronger gas-powered electric washer, the Briggs & Stratton 20545 is going to be worth a serious look. Not only is this one of the lightest gas pressure washers on the market, but it is also one of the most affordable. Briggs & Stratton have been making products for over a century. This is just one example of their products, but there is no question that this is also one of the best examples to be found anywhere. Briggs & Stratton have brought yet another impressive pressure washer to the proceedings. This washer can handle a wide assortment of projects, and you will also find that it is remarkably easy to use. There is a lot about this specific pressure washer that you need to know about. With this 140CC engine pressure washer, there is very little that you are not going to be able to accomplish. This is a versatile tool. Without question, ease of use is one of the biggest considerations with any pressure washer you are thinking about. You want to be able to get to work quickly. In particular, if you don’t have a lot of experience with pressure washers, it seems reasonable to want something you can pick up and use without too much trouble. This is a great pressure washer for beginners. It can also be ideal for more experienced users. Everything about the 20545 is simple, but don’t let that simplicity fool you, in terms of power and functionality. Given that this is a pretty lightweight pressure washer, relatively speaking, you can safely assume that the noise with this particular model isn’t going to be too severe. As gas-powered pressure washers go, this is one of the less noisy options on the market. Obviously, you are still going to have some noise to contend with from the machine itself. This noise will be combined with the actual cleaning you are doing. For most people, all of this noise should be around the level of manageable. It is fairly quiet. Despite weighing only fifty pounds, this is a pressure washer that packs a pretty considerable punch. That punch comes in the form of 2, 2000 PSI of water, with a twenty-five foot hose that guarantees the ability to cover a considerable amount of distance at any time. The power behind this particular pressure water makes it suitable for a number of tasks. This includes projects like washing your car, your driveway, or your patio. It can also handle light furniture. This washer is slightly more powerful than most electric models. The detergent injection system allows you to add the cleaning solution of your choice to the water. Make sure to read all of the directions carefully, as far as the cleaning solution you choose is concerned. 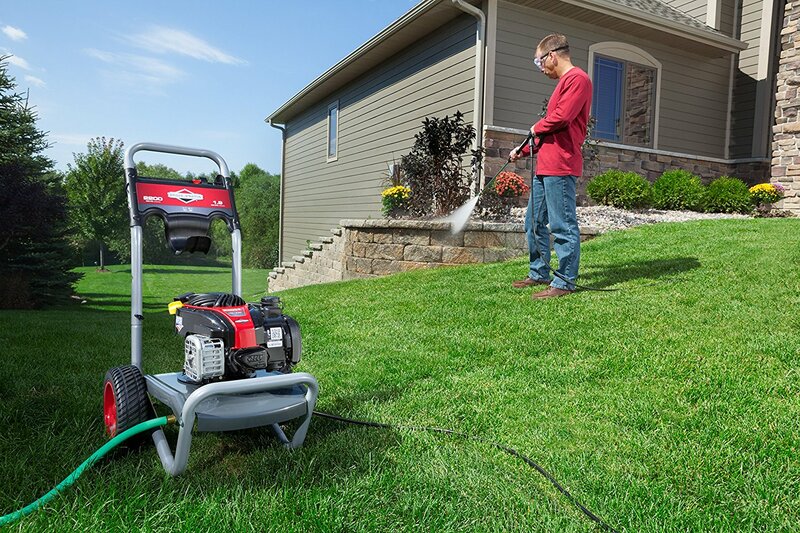 From an application perspective, the 20545 from Briggs & Stratton provides a steady blast of water for your driveway, your car, your patio, or elsewhere. With several different settings, you can easily find the application ideal for whatever you are washing. This washer is more than capable of providing you with the results you need. Coming back again to the lightness of this pressure washer, even when it is full, it is perhaps surprising that this pressure washer also offers comprehensive durability. Yet that is indeed the case. Maintenance for your pressure washer couldn’t be simpler. At the same time, the lightweight model has been built with a certain element of sturdiness and dependability. This thing will work well under a variety of different circumstances. It has clearly been built to last for years to come. Considering the low price tag, this is quite impressive. Another notable element to Briggs & Stratton are the lengths they will go to keep their customers happy. Besides comprehensive customer support measures through their website and other outlets, you will also want to keep in mind that you are also getting a two-year limited warranty. This means that you can likely get replacements for any defects that occur, over the course of the next two years. Overall, it is a good warranty for a pressure washer. You can also count on Briggs and Stratton to honor the warranty terms. Has a 50e Series 140cc Engine. A 25-foot long pressure hose. Includes a 2-year limited warranty. Not too heavy. Packs quite a punch concidering it's low price tag. The included hose doesn't leave much positives to write about. We suggest you buy different one when buying this pressure washer. This entry in the 500e Series is a powerhouse in a light package. This is a great pressure washer to keep around the house. It works well with most home types, and it works well with most materials, as well. Obviously, there are several different types of patios, driveways, and other defining elements of homes. 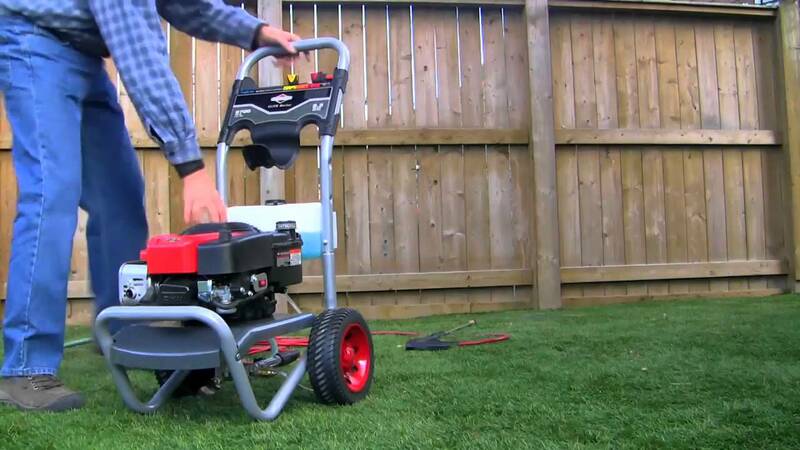 Regardless of what you have, there is an excellent chance that Briggs & Stratton can handle it. This pressure washer in particular should be able to tackle the more involved cleaning projects that you have been meaning to deal with. We can recommend this one to almost anybody.